The charcoal scrub by Barber's club gently cleanses the skin and helps scrub off the dust and dirt off your skin. It is a 100% natural exfoliating scrub which treats acne. 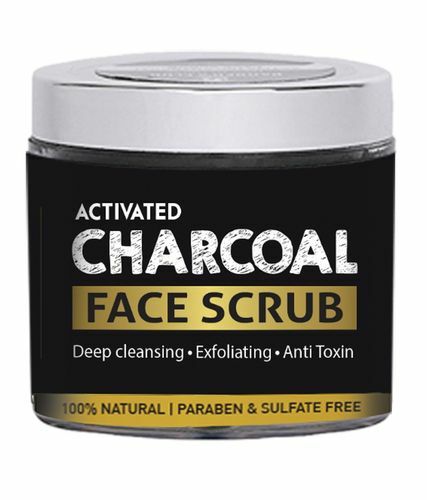 A tried and tested cleansing ingredient, the charcoal scrub has a unique ability to remove blackheads, draw out toxins from the body and rejuvenate the skin. Using this charcoal scrub consistently on your face will tighten up the skin, eliminate dry skin & irritations, minimize pores and remove oil from the skin, leaving you feeling refreshed throughout. Aqua - Aqua is useful when impurities are considered undesirable, thus fighting with them wonderfully. Bentonite Clay - Bentonite Clay helps to remove toxins from your pores, allows skin to heal and reduces inflammation. Fuller's Earth - Known to absorb excess oil from skin, removes scars, treats acne and improves skin elasticity, fuller's earth is also included in the charcoal scrub by Barber's club. Kaolin Clay - Kaolin clay is a fine and light clay that has natural absorbency properties. Glycerin - Glycerin is used to treat many oil skin conditions, like acne, skin infections, wrinkles and fine lines. It is an emollient, making skin soft and supple to the touch. Aloe Vera Gel - It has wound healing and anti-inflammatory properties that reduce skin inflammation. Activated Carbon - Activated carbon draws bacteria, poisons, chemicals, dirt and other micro-particles to the surface of skin, helping you to achieve a flawless complexion and fight acne. Walnut Shell - Walnut shell delays skin aging. It provides moisturized skin, thus bestowing glowing skin. Peppermint Oil - Peppermint oil aids in oil secretion in skin, therefore preventing acne. Tea Tree Oil - Tea tree oil can be attributed to its antibacterial, antimicrobial, antiseptic, antiviral, fungicide properties. It is very much helpful in clearing acne. Xanthan Gum - Xanthan gum has some skin hydrating properties and hence is used in this charcoal scrub.